Previously, we wrote about Servo Motor Buying Guide For DIY Electronics and Robotics. Readers Often Ask About Best Servo Motor For DIY Electronics & Arduino. TowerPro 5010 is the Best Considering Cost, Features & User base. This TowerPro SG 5010 is the model which AdaFruit sells at 3 times price. Most new electronics enthusiasts even do not read basic articles on Servo Motor like that of from us. Some even think that metal gears are good for the servo motors in all situations. 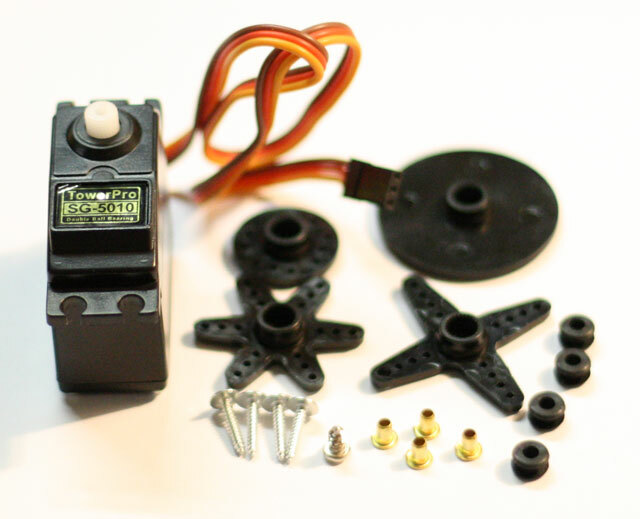 TowerPro SG5010 is a digital servo motor which is used in RC cars, boats or a costly standard servo is too much. Chance of getting a counterfeit is lower with TowerPro due to low price tag. TowerPro servos use Futaba compatible splines. Future is costlier but TowerPro is compatible with Futaba’s spline and arm. Original Futaba S3003 model costs minimum 6 times compared to TowerPro SG5010. At $4 to $8 per piece, there can not be much complain with TowerPro SG5010. Number of stuffs given with TowerPro SG5010 is not less. TowerPro SG5010 is Digital, operates at	4.8V and 6.0V with maximum 6.50 kg-cm displacement, maximum speed is 0.15 sec/60°, weighs under 50 gram, Plastic gears with Dual Bearings and connector type is JR.
Bad points are not really huge in number for basic DIY robotics. Robotic grippers are one part. Another part is using splines, sprockets with chain for maximizing the needed effective force for a work. Like we wrote above, Futaba compatible stuffs are compatible with TowerPro SG 5010. TowerPro SG90 Servo is analog, bushing instead of double bearing and costs next to nothing ($2 per piece). There is no basic physical component difference between a digital servo or analog servo. The difference between the two is in how the signal is processed to power the servo motor. Digital servos are power hungry. We have not trashed TowerPro SG90 Servo for not being analog but purchasing one servo motor suits more with TowerPro SG 5010. It has ball bearing and lot of splines. TowerPro SG 5010 is general purpose, powerful servo motor. This Article Has Been Shared 8633 Times! Here is Our Unique DIY Guide to Build Own Arduino Board (PAPERduino) & Arduino Shields to Save Your Hard Earned Money. They Will Look Cute. Cite this article as: Abhishek Ghosh, "Best Servo Motor For DIY Electronics & Arduino : TowerPro SG 5010," in The Customize Windows, January 13, 2016, April 25, 2019, https://thecustomizewindows.com/2016/01/best-servo-motor-for-diy-electronics-arduino-towerpro-sg-5010/.